Taira no Fumikado (平　文門) is a homunculus that aims to become the "True Emperor" of Mugenri. They used to be human, but they transferred their soul onto a homuncular oni. Fumikado is the stage five boss of Reactivate Majestical Imperial and later became a playable character in Brilliant Pagoda or Haze Castle, as well as a possible stage 5 boss. Fumikado was born in a noble family from the Capital City, but they were orphaned after their parents were murdered on a political power dispute. They were raised by their single grandfather Taira no Iwakado. Said grandfather was an alchemist who wished to resurrect the "True Emperor". He used a body from an oni that he hunted with Fumikado's blood, adding the vital energy and some special qualities from a lot of other living things to manufacture a new life-form. Grateful for taking care of them, Fumikado worked as a medium for him and agreed to take part in those experiments, transferring their soul to the homunculus. When the body was completed as a "vessel", their grandfather had already passed away. They continued his plan with their fellows and vowed to realize it on their grandfather's tomb. They continued to work on the "vessel" planning to improve its physical and spiritual strength, relying on the force of the Taira clan's Saeda flute, that had the power to command spirits. Fumikado's servant, Taira no Chouki, offered to sacrifice their life in order to become a spirit and help Fumikado to control the flute. 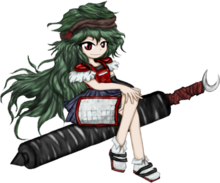 However, Chouki's death was a senseless sacrifice, since as a spirit, they couldn't play the flute. Meanwhile, Fumikado escaped from Capital, as they were pursued by assassins. There, they decided to cross the Gloomy Straits when they met the boater Fujiwara no Iyozane. The latter tried to break the ice and make conversation by telling about their story, which concluded with Iyozane playing the flute for them. After that, they learned each other's names and realized that they belonged to enemy families, but at that point, it didn't matter anymore. Fumikado explained that soon a big hole will open in the internal side of the Mugenri Barrier, and lots of spirits will enter the barrier. They decided to work together, Fumikado giving them a replica of the Saeda flute made by Sukune Katano so Iyozane could be able to control the spirits and guide them. Fumikado comes as a haughty yet dignified person who has the ambition to become an emperor and rule Mugenri. Their lackeys, Fujiwara no Iyozane and Tsugumi Umatachi, spend much of their time complying with Fumikado's whims, but they treat them with respect. Despite their haughty and condescending personality, they acknowledge if someone has more power than their own or when someone is being noble. As shown in Brilliant Pagoda or Haze Castle, they dislike being involved in secular affairs and mostly leave all the work to their lackeys. The only reason why they are so obsessed with ruling and becoming an emperor is because of their promise to their beloved grandfather. They have the power to transfer spirits to anything and everything, but they mostly use that power on themself. For their spell card Substitution "Seven Shadows", Fumikado uses copies of themself. The game profile for Brilliant Pagoda or Haze Castle reveals that this is because they have multiple clones of their body stored and in case their current body died, they can transfer it to one of the clones. Their character may be a homage to Toyosatomimi no Miko , because both are from royal lineage who cheated death by transferring their souls into another body. They also want to rule over the new land they find themselves into and have a pair of lackeys. Their full name is Taira no Fumikado (平　文門). The hiragana character no (の) used here indicates a "belonging", thus the English equivalent of their name would be "Fumikado of the Taira". In ancient Japan times, it was common for aristocrats with a clan's name to have no between their clan's name and first name. They have long green hair that reaches past their waist. They wear a brown hairband on their head, geta shoes, a red top tank with a blue hakama skirt. They have red eyes, pointy ears and fangs, because the homunculus which they transferred their soul to is a homuncular oni child. Fumikado decides to take advantage of the abundance of spirits in for their ceremony, when they plan to revive the soul of Taira no Masakado and transfer his soul to their body. They ally with Iyozane (since they were able to use the Saeda flute) and Tsugumi Umatachi, hired by Iyozane. They're tasked with using their powers to herd the spirits and guide them to where Fumikado is making their resurrection ceremony. Unfortunately for their plans, Tsugumi and Iyozane are defeated by the heroes and the latter confesses about Fumikado's plans. The heroes go to the resurrection ceremony in order to stop Fumikado, who is upset that their lackeys have failed their mission and that there are no spirits. After their defeat at the hands of the heroes, Fumikado reveals that their plan didn't work because, despite the power of the flute, the spirits are being attracted to another location, which happens to be the Withered Grove, where the Harujion is. Even though their plan failed, Fumikado is still friendly and cordial to the heroes and even visits the shrine to explain that they were not involved in the sudden affluent of spirits. Despite their fall from grace, Fumikado plans to take over Mugenri and together with Iyozane and Tsugumi, they go to resolve the incident. They find out that they are a wanted criminal in the Capital City and their main supporters, the Dragonfly Army, have turned against them because they didn't complete the ritual in the previous game. Iyozane is their ally, but originally were the enemy from each other's family. They hope to become a famous and influential person if they ally with Fumikado. One of Fumikado's lackeys. It's unknown when did they met, but apparently both came from the Capital. Tsugumi is unable to understand their master's ambitions, but obeys them nonetheless. Fumikado's family is known; they had a grandfather‎ named Taira no Iwakado, a father named Taira no Onikado and a mother named Taira no Fumina. The grandfather was the one who raised Fumikado because they didn't have their parents. He was also the one who wanted to resurrect the "True Emperor", having Fumikado to follow his dream after he died. 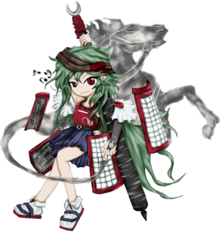 Chouki was raised by Fumikado's grandfather to become Fumik‎ado's servant. 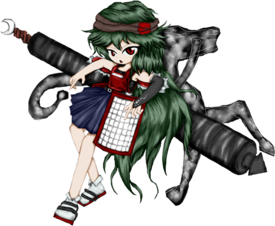 They were good friends and Chouki assisted with the plan to resurrect Masakado, but they needed to control the Saeda of the Tairas. Chouki made a deal with a god who controlled dead, in order to have a body "in the verge of life and death". However, their sacrifice was in vain, since as a dead body, Chouki was unable to play the Saeda. Fumikado decided to dismiss Chouki afterwards (possibly out of concern for them), but Chouki felt betrayed that they had been discarded by Fumikado and started to despise them, becoming an evil spirit. Fumikado does feel guilt about Chouki's fate and is devastated to see that they became their enemy and rival for the title of the emperor. When Chouki expresses their desire to kill and get revenge on Fumikado, they say that they don't mind being killed by them. Illustration of Fumikado with Iyozane and Tsugumi for Len'en Project's 2nd anniversary. ↑ myōken (妙剣, "strange sword") is a homophone of Myōken. ↑ A reference to legends about Taira no Masakado having a body made of iron. ↑ A reference to legends about Taira no Masakado having seven lives, represented by the stars in the Big Dipper. According to JynX's music room comments, Fumikado was originally meant to be the stage 6 boss. It's unknown if they are actually related to Taira no Masakado or claims to be, since they wanted to transfer his soul to their vessel body. Conversations in-game imply that Fumikado is not related to Masakado in any way, but has deluded themself into believing it. According to JynX, Fumikado's spiked iron club, a weapon commonly used by the oni in Japanese mythology, was made by Yago Ametsukana. The horse that shows up behind Fumikado in Reactivate Majestical Imperial is called "Tsunagi-Uma" (繋馬, lit. "Connecting Horse"), which can control its own size and is usually about the size of a piece of candy. It can be called upon when needed. Its design is derived from an emblem of the same name, belonging to the Sōma Clan. ↑ "It's a club with a pointy tip. Yago made." This page was last edited on 19 March 2019, at 04:39.